Julie Reed is a versatile graphic and surface designer, craftsman, and collector who lives and works in Kansas City. Inspired by the natural world, Victorian crafts, textiles, and the vintage objects and ephemera she collects, Julie's work incorporates these passions into refined and elegant designs and patterns that appeal to the present day consumer. During her many years as a professional designer/art director, Julie gained expertise in a variety of categories. She designed flooring for Armstrong World Industries, paper goods, party ware, jewelry, cards and gifts for Hallmark, and scrapbook products, jewelry and craft kits for K&Company. In February 2012, Julie followed her lifelong dream and began her own freelance design and art licensing business. 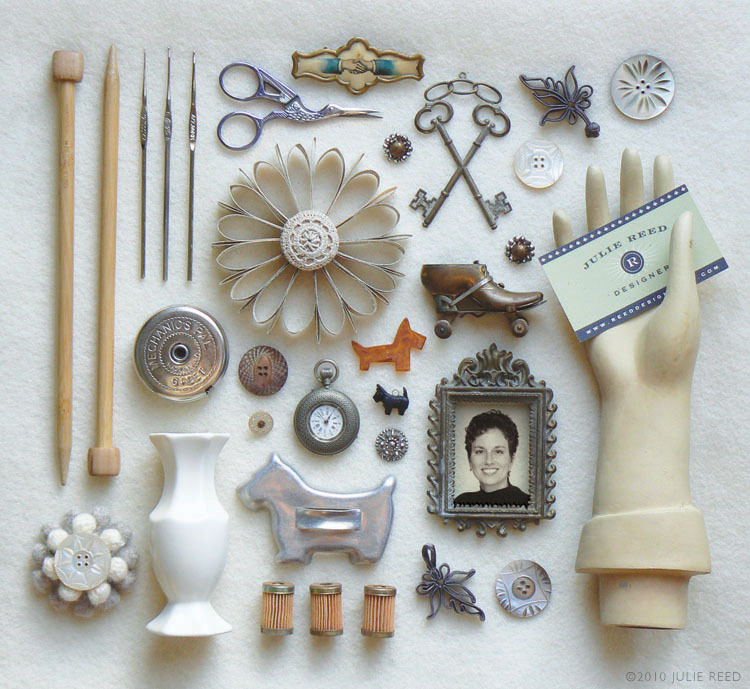 Illustrated above in her object portrait, are some of Julie's favorite things - intricately carved mother of pearl buttons, bits of fraternal medals, vintage ribbon frogs, a crocheted button, sewing & needlework tools, a handmade paper medallion, a broken, yet beautifully patterned pocket watch, a child's glove form, a McCoy vase, a Mechanic's Pal tape measure that travels with her to every antique show and flea market, and a few scottish terrier themed pieces. Visit Julie's blog, Bricolage, Pinterest boards, and Instagram to keep up with her current inspirations, interests and exploits with her two scotties, Sprocket and Spott.